You may not fully understand what this saying means on a personal level, but that is the purpose of this letter. I am the mother of an amazing daughter. I would like to share my story because it may be similar to yours and I feel very lucky to have come to this place to better understand my daughter and myself. My daughter’s story started when she was 13 and got her period. Then she met a boy while at college and then she asked me to read a book! That is the quick version of course. You see, my daughter has had several issues growing up. The two major ones were anxiety and vaginismus. I thought I understood both of them, and maybe I did, but if I did, I only understood them as a mother, not as my daughter. 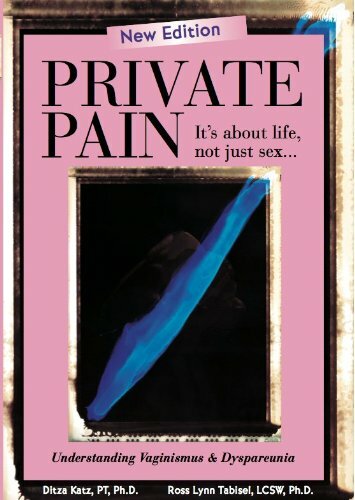 So if you haven’t read the book Private Pain by Drs. Ross and Ditza, read it, alone, after your daughter has read it and underlined the parts that describe her. But discuss it with her when you can. I was convinced I knew my child, but I clearly I didn’t understand what she was feeling about herself. So I called Drs. Ross and Ditza and spoke to them about their therapy center and tried to understand what vaginismus really was. I called about 3 times because I had read their book, and they said they were 95% successful. Now that I had a better understanding of my daughter’s “pain,” I had to understand what this whole treatment was about. I had to find a way to trust them, really trust them because this was the last option. But….I had to trust my daughter who also saw this as an amazing opportunity and last option to have a “normal” life. I had to get to her level of desire and vulnerability. I had to understand that she didn’t have a “normal” life nor feel she ever would. She had already talked with them and believed they could help her. I needed to trust these doctors because my daughter needed to trust them, and I needed to trust her. So I found the money, found the time to take off of work, and found the strength to walk, with my daughter, through those doors into the trust of three amazing women. It is not easy to let unknown villagers take your daughter’s hand and help her in a way you could not, but you cannot do what these women can do, and you have to have faith and trust in them to help support what you may not completely understand about your daughter. You must allow another to intervene into your fears and misconceptions to allow yourself to grow because you and your daughter are going through this together, just differently. We entered the village together and I am so proud of us. We have learned together. We have understood together. We have trusted together! We have become part of a village that has brought her new life opportunities. Breathe deep, mother. Exhale slowly.